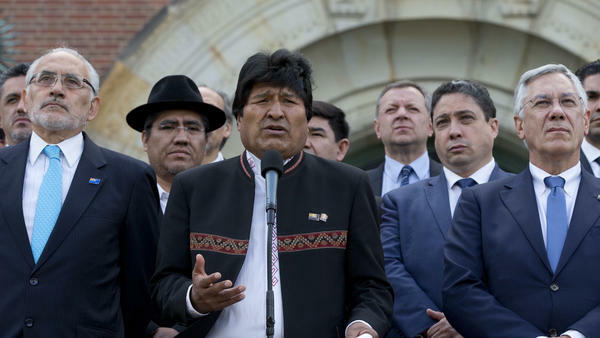 Bolivian President Evo Morales (center) gave a brief statement Monday after the judgment was delivered on a request by Bolivia for judges to order Chile to enter talks over granting its landlocked neighbor access to the Pacific Ocean. The top U.N. court has dashed hopes for Bolivians longing for something they haven't had for more than a century: Access to the Pacific Ocean. In a judgment on Monday, the International Court of Justice stated that it did not find that Bolivia's neighbor Chile has a legal obligation to enter into negotiations with Bolivia about access to the ocean. The vote on the decision was 12-3. It's a crushing blow to Bolivian President Evo Morales, who traveled to The Hague to hear the court's judgment. According to Reuters, he has "bolstered his popularity with the nationalistic bid for sea access" as he prepares for a campaign for a fourth term next year. As the judgment was read, the BBC reported, "Morales's face turned increasingly sombre." Long, thin Chile has nearly 4,000 miles of coastline. And for Bolivians, regaining ocean access is "part of the national narrative," as NPR's Lulu Garcia-Navarro has reported: "It still has a navy, even though the country is stranded high in the Andes. Every year, Bolivians mark the Day of the Sea, where politicians give speeches and people listen to the recorded sound of seagulls." When Bolivia gained its independence from Spain, it had nearly 250 miles of coastline, court documents state. But during the War of the Pacific, which started in 1879, Chile seized Bolivia's coastal territory. In 1904, a peace treaty between Chile and Bolivia further solidified Chile's claim to the coast, saying the land belonged to Chile "absolutely and in perpetuity," according to the ICJ. In the years since then, Chile has at times said it was open to discussing the matter with Bolivia. Bolivia claimed that that created "an obligation to negotiate Bolivia's sovereign access to the sea." The court did not find that argument compelling, however, because Chile's declarations "are expressed not in terms of undertaking a legal obligation but of willingness to enter into negotiations." The court also dismissed seven other lines of argument from Bolivia which it said compelled Chile to enter negotiations. The decision is final and binding. Still, Bolivia's push to gain Pacific access isn't necessarily over. As court president Abdulqawi Ahmed Yusuf wrote in the judgment, "the Court's finding should not be understood as precluding the Parties from continuing their dialogue and exchanges, in a spirit of good neighbourliness, to address the issues relating to the landlocked situation of Bolivia, the solution to which they have both recognized to be a matter of mutual interest." "The demand by Bolivia's government had no foundation, neither historical, political or legal, and that is why it was categorically rejected," said Chile's president, Sebastian Pinera, according to a Reuters translation. He added that the move caused the two countries to lose "five years in healthy and necessary relations." Many Bolivians were crestfallen by the news. The AP reports that crowds gathered to watch the ruling in a public square in La Paz. "While there had been folkloric dances and celebrations before the ruling, people walked away in silence afterward," the wire service reported. At the moment, the BBC reports, "much of Bolivia's trade passes through Chilean ports and Bolivia argued that having sovereign access to the Pacific Ocean was key to its economy and would have boosted growth."